In the first event of the night, Simon Sjödin put on a dominating performance to win the 200 fly in 1:58.11. The winning time was just under the previous meet record of 1:58.32. The veteran was over 5 seconds faster than anyone else in the field, with Markus Malm finishing 2nd in 2:03.88 and Viktor Björk 3rd in 2:04.76. Sarah Sjöström crushed the field in finals to win the event in 1:55.94 with a new meet record. That time cleared her old record of 1:56.56. Louise Hansson was the only other woman under 2 minutes, finishing in 1:59.23. Michelle Coleman touched the wall to round out the top 3 in 2:01.51. University of Southern California senior Henriette Stenkvist finished 5th in 2:02.78, just 3-hundredths of a second behind her former Trojan teammate Stina Gardell. Winning the men’s 100 free, Oscar Ekström hit the pad in 50.79. That’s just 4 tenths off of his 50.35 he swam in 2012 to set the Swedish junior record. Christoffer Carlsen finished 2nd in 51.10, just ahead of Daniel Forndal. Forndal, the youngest swimmer in the final, took the bronze in 51.31. Taking down yet another meet record, Sarah Sjöström, won the gold in the sprint backstroke event. She chipped off .07 from Michelle Coleman’s previous record, finishing in 28.67. 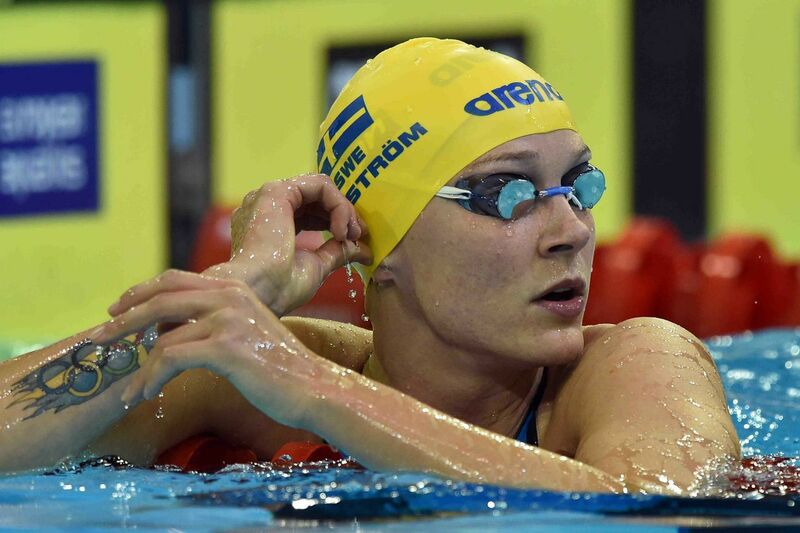 Silver medalist Ida Lindborg made it a close race, finishing 2nd with a 28.89. Coleman was also in the final, clocking in at 29.52. She placed 5th behind FGCU All-American Emma Svensson. Svensson just missed the bronze with a 29.46. Erik Persson took control of the mens 200 breast from start to finish, clocking in at 2:12.51. His time broke his previous meet record of 2:13.43 that he set last year. 3 other swimmers in the race were under 2:20. Gulliver Koch won silver in 2:18.45. Behind him, Robert Palosaari claimed bronze 2:19.06, holding off 4th place finisher Linus Kanth, who charged home to a 2:19.98. Amanda Rutqvist recently completed her NCAA eligibility with the University of South Carolina. Moving on to long course, she put up a solid performance on the first day at Swedish Nationals. Rutvqist won the 200 breast in a time of 2:28.95. 2nd place finisher Jennie Johansson touched the wall in 2:29.22, closing the gap on the last 50 to make it a tight race. Vilma Ekström and Vendela Norrman battled it out for 3rd, finishing in 2:32.42 and 2:42.83 respectively. The lone man under 16 minutes, Christopher Jedel, won the men’s mile in 15:46.87. He led the race from the start, finishing well ahead of Simon Plato, who put up a good race to win silver in 16:10.10. Plato split his race well, passing Victor Johansson around the halfway point of the race. Johansson hung on for the bronze, just 3 seconds behind in 16:13.15.